“Leave Me Alone with My Dreams.” Written by Joseph George Gilbert (1932). Recorded by Ray Starita and His Ambassadors, with Elsie Carlisle as vocalist, on March 2, 1932. Sterno 923. 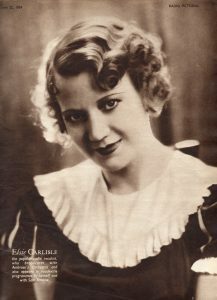 1932 was the year of Elsie Carlisle’s collaboration with Ray Starita’s Ambassadors’ Band; their output includes “Let That Be a Lesson to You,” “I Heard,” and “On a Dreamy Afternoon.” Even though she only sings for 46 seconds in their recording of “Leave Me Alone with My Dreams,” she adds a memorably wistful touch to this mellow foxtrot. In the lone verse allotted to her she alludes to the loving affection she hopes to enjoy in a fantasy world into which she has retreated. The conceit is simple yet poignant. The music and lyrics were written by Joseph George Gilbert, who is better known for his collaborations (as lyricist) with Lawrence Wright (who often went under the pseudonym “Horatio Nicholls”). 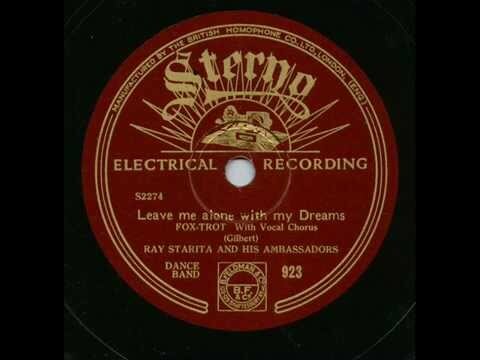 “Leave Me Alone with My Dreams” was also recorded in April 1932 by the New BBC Dance Orchestra (directed by Henry Hall, with vocals by Val Rosing, in a Douglas Brownsmith arrangement), and by Arthur Lally (Sam Brown, vocalist).